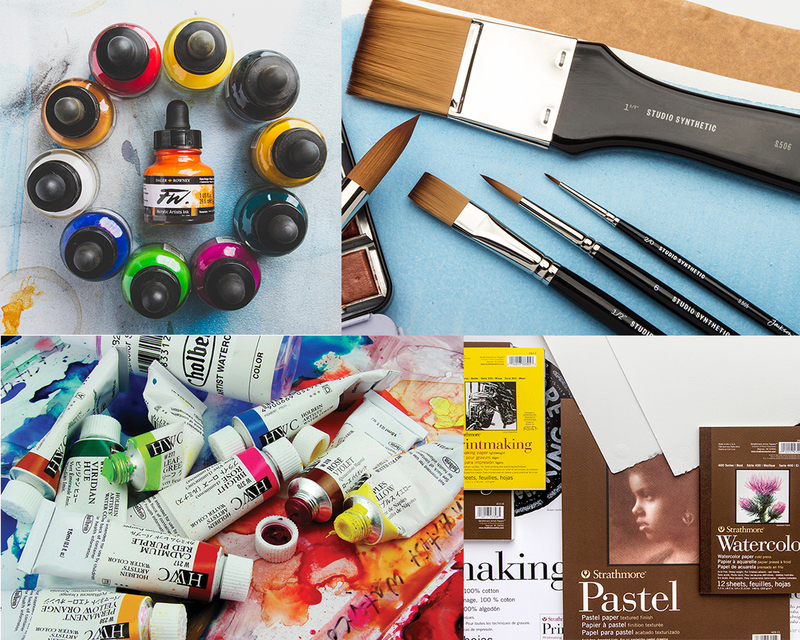 Art supplies that are cruelty-free or without the use of animal products is an important concern for many artists. While some would argue that you simply cannot replicate or replace natural hair or ingredients within certain products, there is a growing need for synthetic brushes or for clarification as to which art materials do not contain animal products. We thought to cover a few items for those of you that would like to use cruelty-free art supplies, this is by no means a definitive list and if you have any to add please let us know and we will add them on! Watercolour papers are traditionally sized, or treated with a substance to reduce the absorbency of the paper. Usually to make the sheets less porous, the paper is coated in a gelatin based glue, gelatin being the collagen which is extracted from the skin, bones, and connective tissues of animals. Bockingford Watercolour Paper is not externally sized with an animal derived size. Traditionally made on a cylinder mould machine at St Cuthberts Mill, its attractive surface is created using natural woollen felts that give it a distinctive texture. Appreciated for its excellent colour lifting abilities. Canson Moulin Du Roy Watercolour Paper is sized with starch, not gelatin and therefore can be classed as vegan friendly. 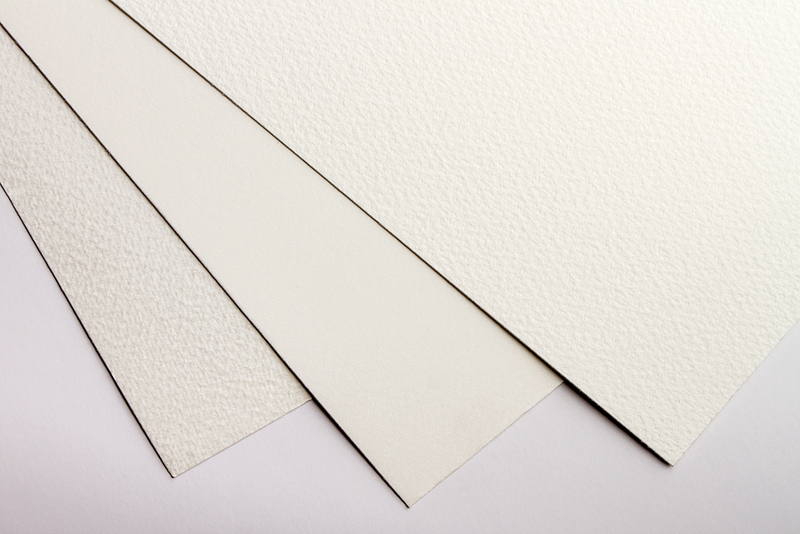 Produced on a traditional cylinder mould machine, this paper has the look and feel of a handmade paper. Both absorbent and strong, Moulin du Roy has internal and surface sizing permit the lifting of dried colour and the reworking of watercolour. 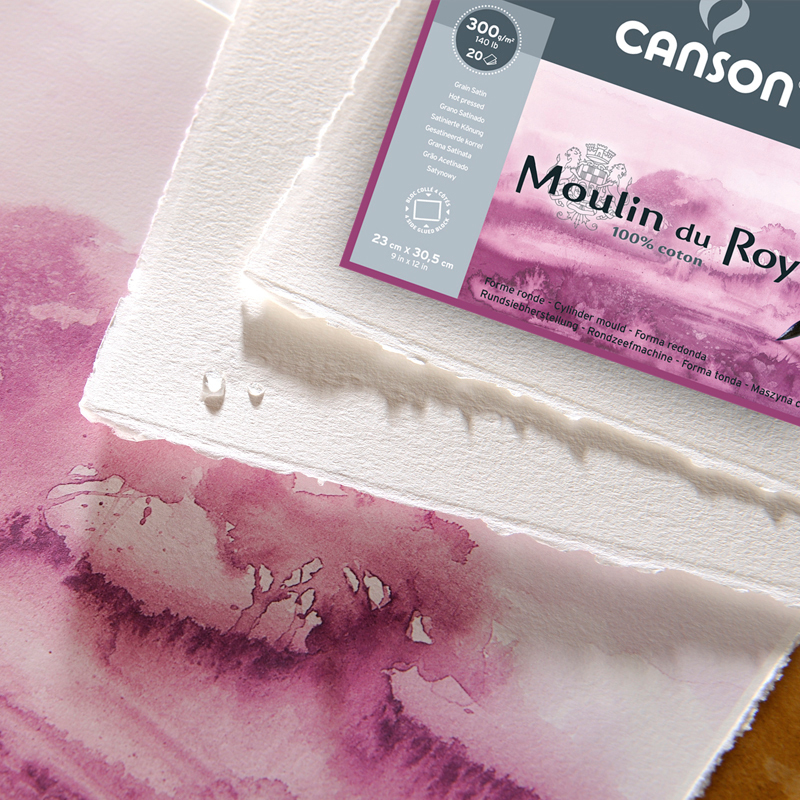 Canson Moulin du Roy watercolour paper is naturally white, acid free and made entirely without bleaching agents, for an optimal conservation over time. 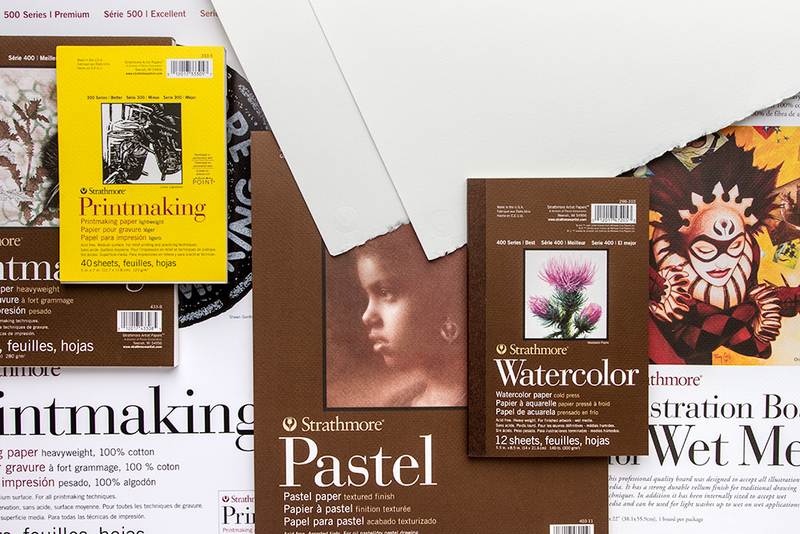 Strathmore Papers – Strathmore use plant-based and synthetic sizing in the manufacturing of nearly all of their papers, excluding the 500 Series Gemini Watercolour Paper which uses an animal byproduct to size the paper. All of their other papers are vegan friendly and only use plant-based and synthetic sizing. Fabriano Artistico Traditional White Watercolour Paper – This paper is externally and internally sized with a specially formulated, gelatin-free sizing that is odourless when wet. Therefore it does not contain animal products. 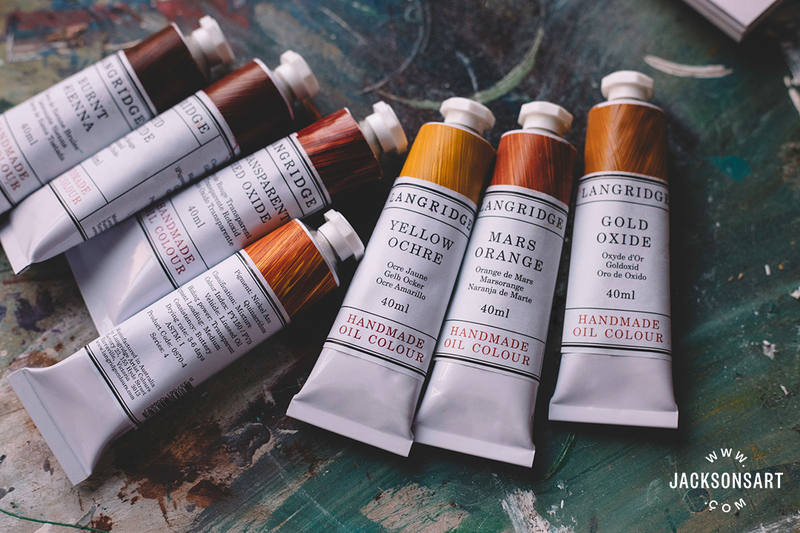 It is ideal for watercolour, tempera, gouache, acrylic, ink, charcoal, graphite and drawing. 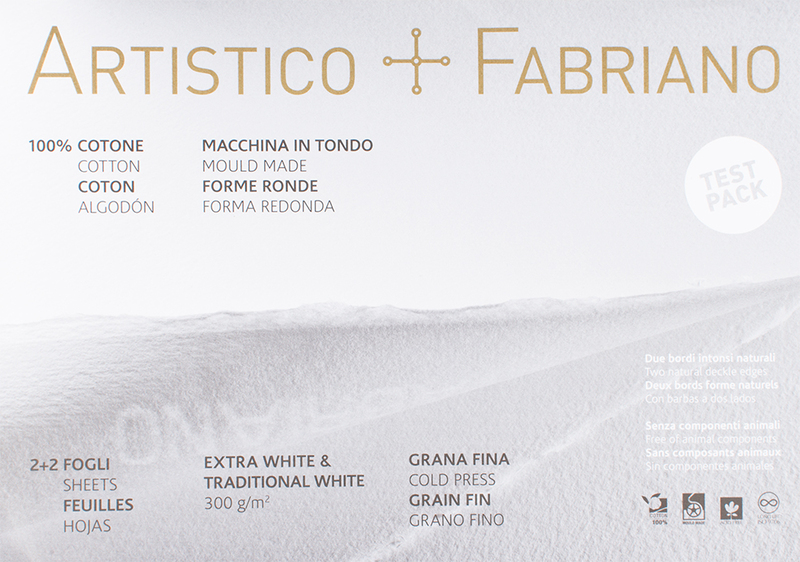 Fabriano Artistico watercolour paper is mould made, produced with 100% cotton, chlorine and acid free, guaranteeing long conservation and inalterability over time. 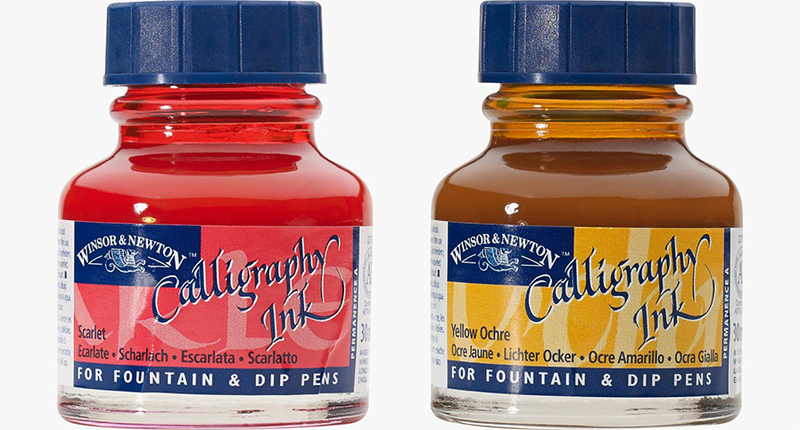 Winsor & Newton Calligraphy Inks contain no animal derived ingredients however their Drawing Ink range contains soluble dyes in a superior shellac solution. Shellac is a resin secreted by the female lac bug and so therefore the Drawing Ink range can not be considered vegan/free from animal derived ingredients. Here is a really useful pdf which lists many of the Winsor & Newton products, detailing whether they include animal derived ingredients. All the inks with Winsor & Newton’s Calligraphy Ink range have been formulated with carefully chosen pigments to ensure maximum brilliance of colour. 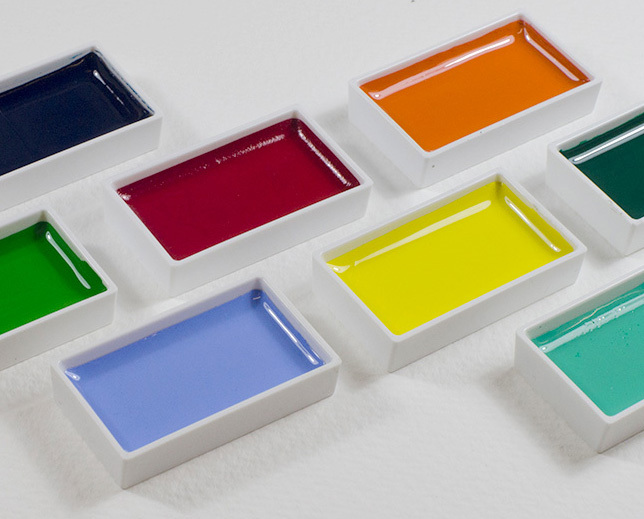 Single pigments have been used wherever possible to make clean colour mixtures. The formulations of the inks are non waterproof ensuring they are non clogging and have good flow characteristics when used in a fountain or dip pen. Daler Rowney FW Artists’ Inks do not contain animal products or animal by-products. 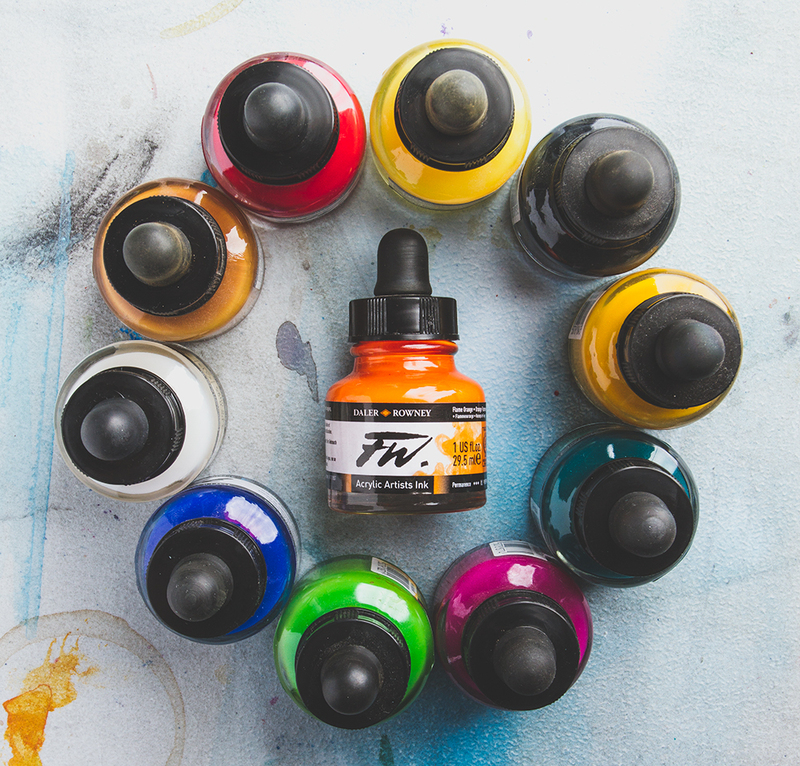 FW Artists’ Ink is an acrylic based pigmented water resistant ink in a range of 38 colours, all of which have either a 3 or 4 star rating for permanence. Colours can be substantially diluted to achieve the most subtle of tones, very similar in character to watercolour. Such washes will dry to a water resistant film and successive layers of colour can be applied. Schmincke AERO Professional Colours are totally free of animal products. Aero Colour Professional are highly light-resistant, brilliant air-brush colours developed especially for use with an air-brush spray-gun, they can also be used with retouching pens, dip-pens and brushes. All colours are ready-to-use and can also be used undiluted due to their very fine pigmentation. 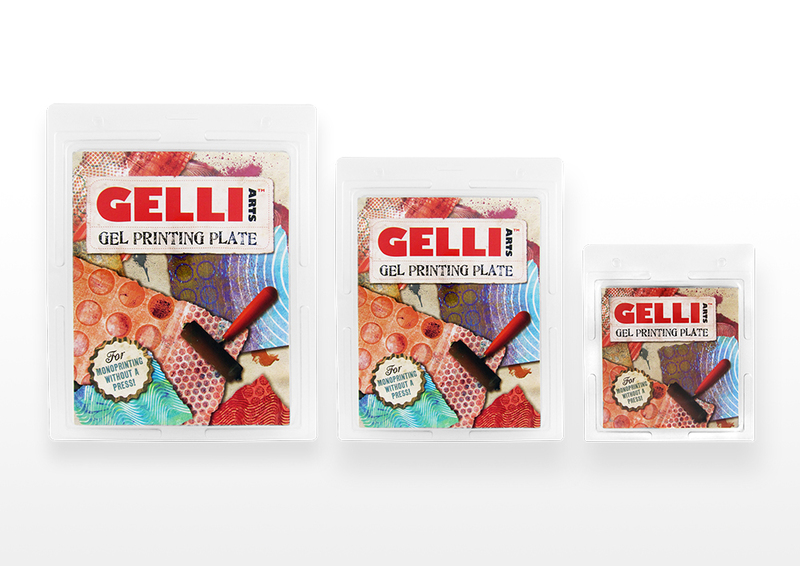 Gelli Plates for printmaking – There is no gelatin in a Gelli Plate or animal products, therefore they are considered completely ‘vegetarian friendly.’ They are durable, reusable and easy to clean, meaning they are always ready for printing. Available as a 6x6in, 8x10in, 12x14in or an 8inch round plate. Gansai Tambi Watercolours are traditional Japanese watercolours for professional artists and crafters alike. These extra large pans (4.5 x 2.5cm) of brilliant, luminous, high-performance paints are ideal for sketching, illustration, sumi-e, manga, calligraphy and more. The range includes a good selection of vivid colours with creamy consistencies. All Gansai Tambi Watercolours are vegan and cruelty-free. 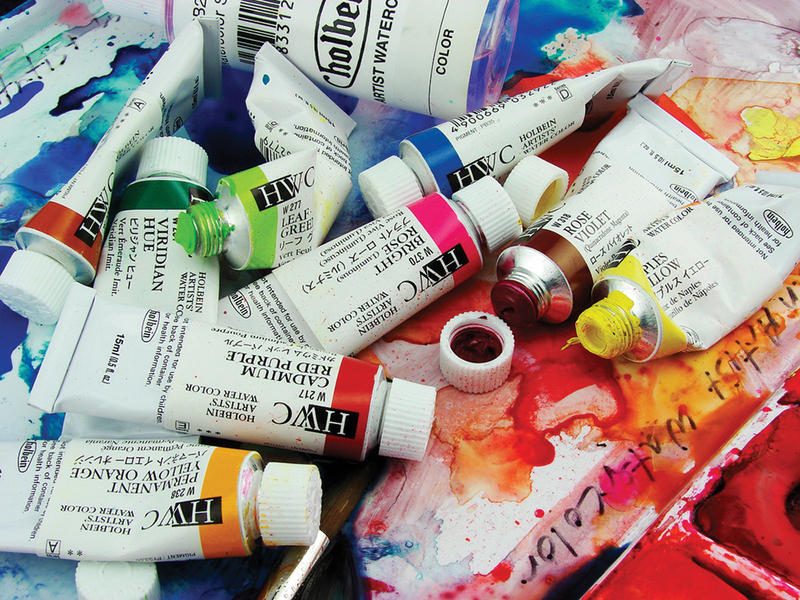 Holbein Watercolours are manufactured without the use of ox-gall, animal by-products or other dispersing agents. This means that their colours are much stronger and allow for greater density of coverage, allowing a much more controlled application of colour. 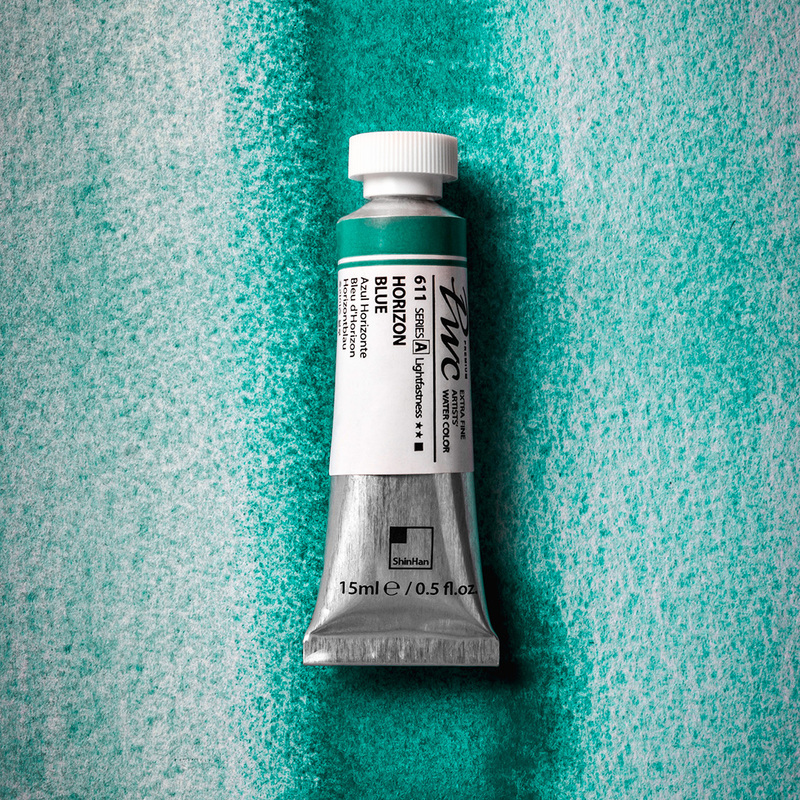 It has a creamy texture that remains smooth when dry, meaning you can re-wet colours easily. All the colours within the range (except Ivory Black PBk9 which is made from charred animal bones) are animal friendly. 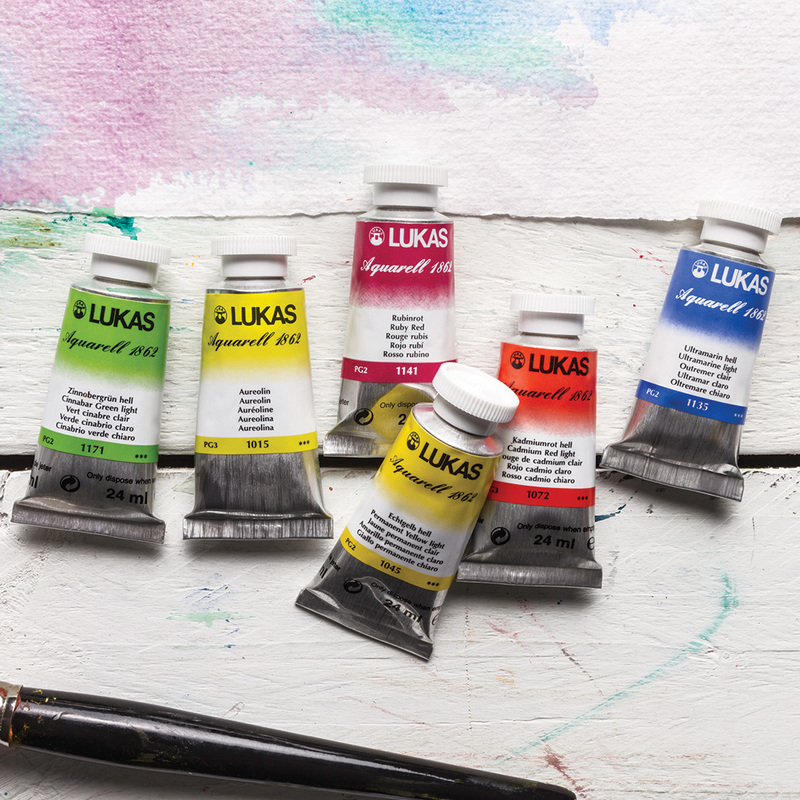 Lukas 1862 Watercolours are manufactured without the use of ox-gall, animal by-products or other dispersing agents. This means that their colours are much stronger and allow for greater density of coverage, allowing a much more controlled application of colour. It has a creamy texture that remains smooth when dry, meaning you can re-wet colours easily. All the colours within the range (except Ivory Black PBk9 which is made from charred animal bones) are animal friendly. ShinHan Premium Watercolours are free from animal derived ingredients with the exception of colour 683 Ivory Black. ShinHan Premium Watercolours are crafted with the finest high-grade gum Arabic. To enhance the clarity and depth of colour, single-pigments are used whenever possible and the usage of mixed pigments has been limited. The ShinHan palette offers colours that are transparent and subtle, yet intense and vibrant, allowing for an even greater freedom of expression. 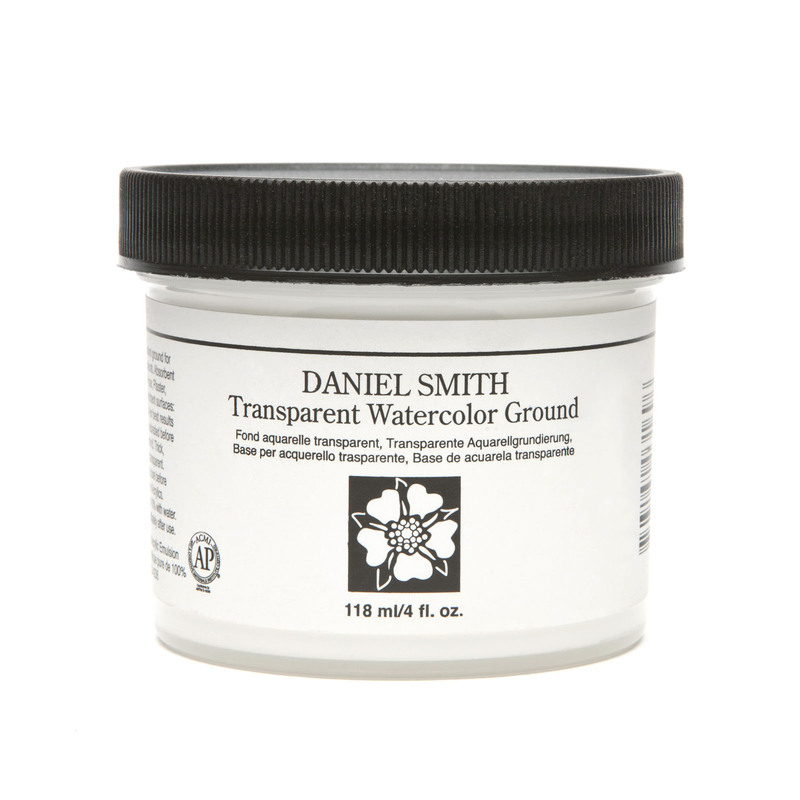 Daniel Smith Watercolour Grounds allow you to make almost any surface suitable for watercolour painting, from stone or wood to cloth, ceramic or plastic. This ground will also support collage, pastels, pencils and mixed media work. The product is classed by Daniel Smith as vegan friendly. Ox-Gall is a wetting agent that improves the flow of watercolour paint, which usually comes from the gallbladder of cattle. 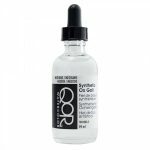 Golden QOR Watercolour Synthetic Ox Gall does not contain animal ingredients and would make an alternative when using watercolour paint. Rabbit skin glue is also called hide glue and is a general name for glue made by rendering an assortment of animal parts. It is a traditional glue used in the preparation of gesso, as a sealant (size) on canvas (and wood panels) underneath gesso, and as a glue in some book making. 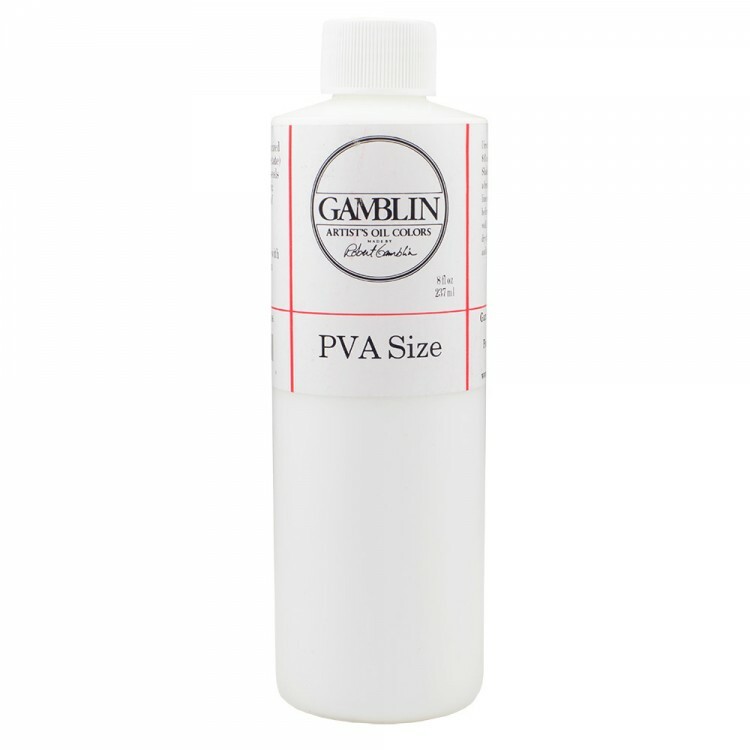 An alternative to Rabbit Skin Glue sizing, although not exactly the same, would be the Gamblin PVA Size – PVA Size would be considered a vegan product as it is a neutral pH polyvinyl acetate glue thinned with distilled water. PVA provides a good size layer that seals the fabric but does not re-absorb atmospheric moisture, swell and shrink like rabbit skin glue does. PVA size also doesn’t tighten fabric like animal glue. Amsterdam Acrylic Standard Series has not been tested on animals and does not contain any animal-derived ingredients. This range of acrylic has a high degree of lightfastness throughout its 70 colours, the paint is durable thanks to a binding agent which consists of 100% acrylic resin and can easily be thinned with water. It has a short drying time; thin films of paint dry within half an hour. Langridge Oils are completely vegan. They do not use any directly or indirectly sourced animal based products in their paints. All Artist Oil Colours with the exception of Ivory Black and Blue Black; All Georgian Oil Colours with the exception of Ivory Black, Prussian Green and Coeruleum Hue; All Cryla colours with the exception of Ivory Black; All Designer’s Gouache with the exception of Neutral Grey 2, Paynes Grey, Lamp Black, Cool Grey 1,2, & 3 and Warm Grey 1,2, & 3. All System 3 colours with the exception of Raw Sienna. 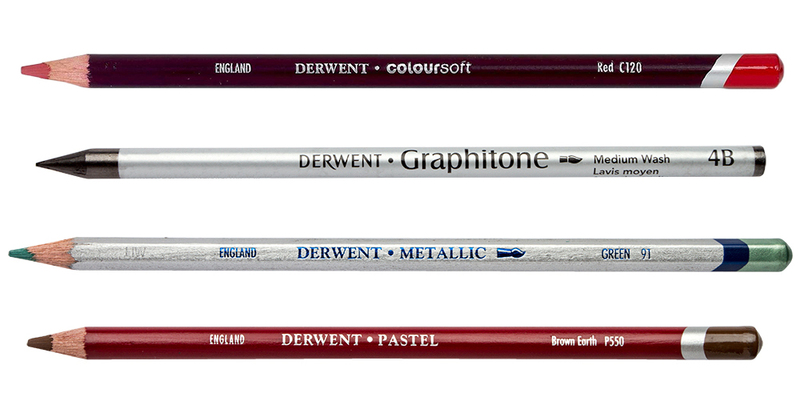 All Derwent Coloursoft Pencils, Derwent Metallics, Derwent Pastel Pencils and Derwent Graphitone are all free from animal ingredients. Faber-Castell Polychromos and Albrecht Dürer products contain no animal ingredients, using inorganic and synthetic materials and materials of plant origin. 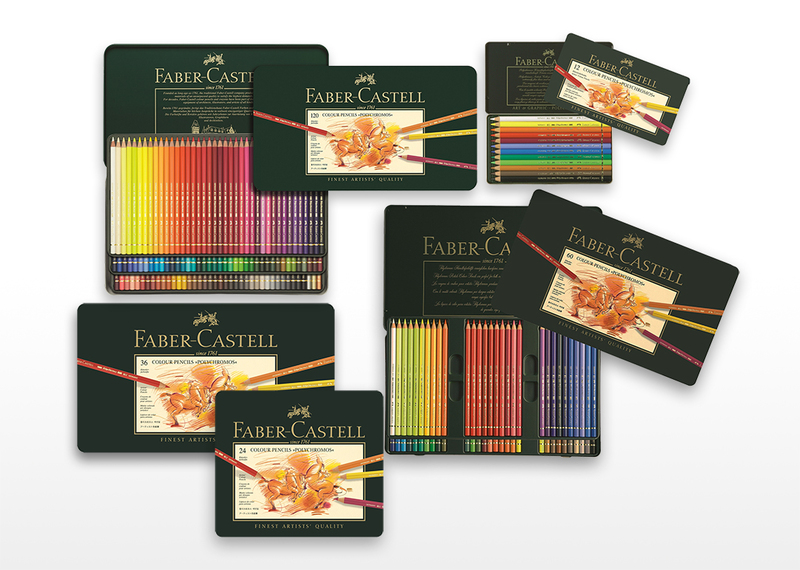 Faber-Castell have not initiated any animal testing on products or materials for 22 years, and do not use casein glue in packaging. 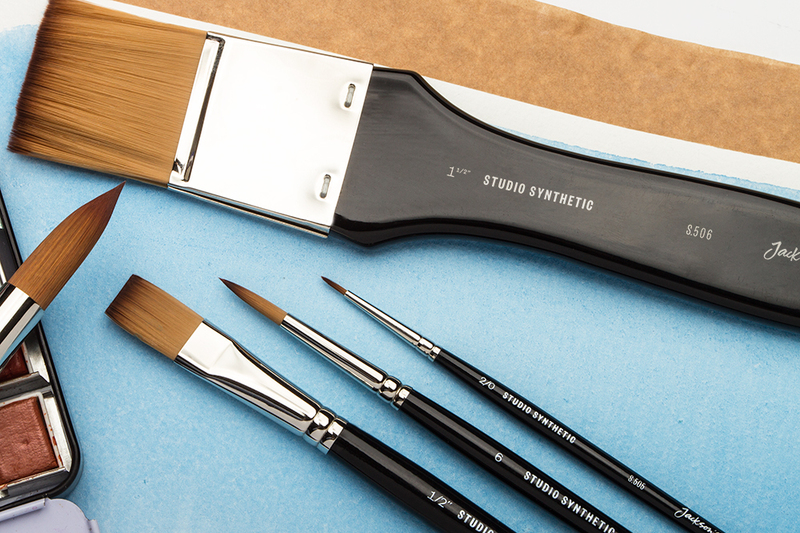 Jackson’s Studio Synthetic Watercolour Brushes are made from the highest quality synthetic available, and so do not contain animal hair. There are also no animal products in the glues or varnishes used on the ferrules or handles, and so are completely free from animal ingredients. They have a superb point, great colour holding capacity and a lovely spring. This is also true for Jackson’s Akoya, Raven, Shinku, Procryl and Onyx brush ranges. information and passing it on to us. Hi Alison, thank you so much for this. I will definitely add the pdf in! mm in your shop on 1 Farleigh place? I use Escoda Modernista brushes and they are great! dead-animal products so it’s very helpful. as good. Is that cruelty free? I am waiting to hear back from Caran d’Ache, who might be another alternative for you. Both brands are very highly regarded. Let me know if there’s anything else I can do for you! Hello! Most acrylics’ bases will be animal free, so you just need to chose a vegan pigment. Mars Black is a good example as it is made from Iron Oxide (rust). I’d recommend avoiding Bone Black as that’s often made from bone ash. Hope this helps! Great article, this is so helpful! Came here to say the same thing. Wool is not vegan. wool. Thanks for highlighting it! into the paper, is it true? Hello Sigrid, thank you for your comment. Ox-gall is a wetting agent that increases the flow of your watercolours by reducing the surface tension of the water you mix them with. This helps reduce marbling, resulting in more even washes. It can also be used on very hard sized papers to reduce surface tension – this allows the watercolour to sink into the paper faster. I’m not aware of it increases the adhesion of the paint though; please may you share the article with us? In terms of Daniel Smith and Maimeri Blu Watercolours we’re not sure but I have contacted the suppliers. Although their general formula may not include honey or ox-gall, specific pigments (i.e. Bone Black) may be made from animal products. 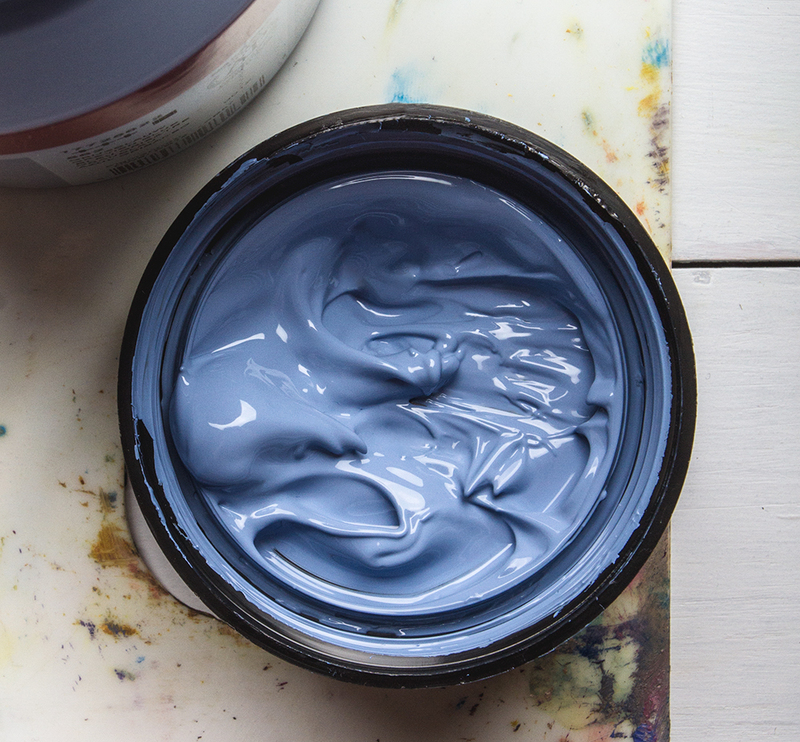 The Maimeri Blu Watercolour Range is not marked as Vegan as the Ivory Black paint contains bone and the Natural Ox Gall Medium contains ox gall, however the rest of their range does not contain animal products. The only animal-derived ingredient is the pigment pBK9. pBK9 is found in the following colors only: Sepia, Ivory Black & Payne’s Gray. are vegan and gave more details. are very open about it. ingredients, apart from Ivory Black. That’s great to hear, thank you for contacting them and for the info on Talens too! out there trying to do our best to not use animal products. You have helped us a lot! Thanks for finding vegan art supplies, very helpful. gelatin or if they are vegan friendly. Are you looking for a gold size (gilding adhesive) that is animal-free? We do oil size, water size and acrylic size with a variety of open times. They are all animal-free. could source some information about this. 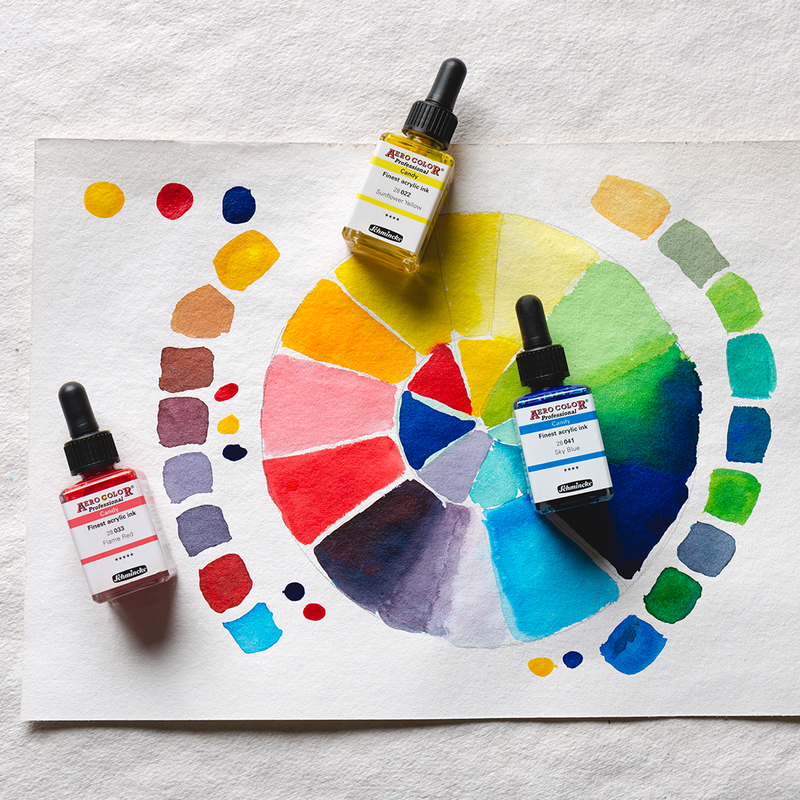 Winsor and Newton Designer’s Gouache have 17 colours that contain animal derived ingredients: Ivory Black, Raw Sienna, Winsor Green, Spectrum Yellow, Intense Blue, Sky Blue, Purple Lake, Prussian Blue, Linden Green, Ivory Black, Grenadine, Flame Red, Burnt Umber, Bengal Rose, Primary Blue, Lamp Black and Spectrum Violet. 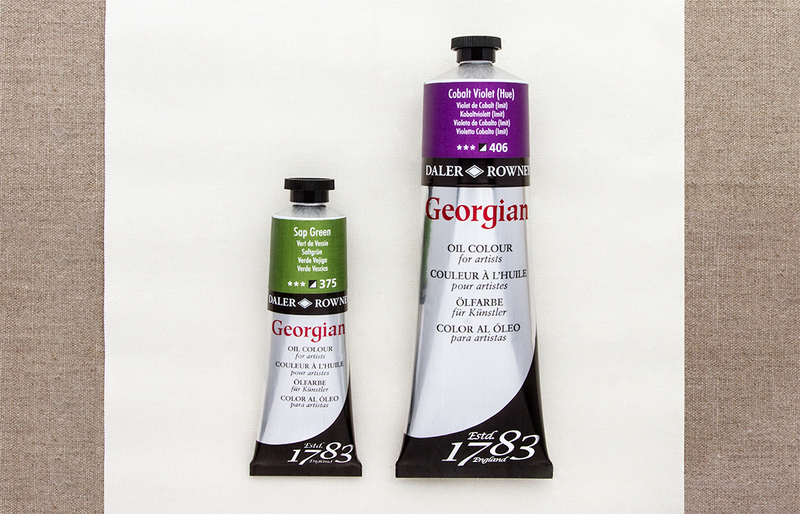 All Daler Rowney’s Designer’s Gouache is free from animal ingredients with the exception of colour Neutral Grey 2, Paynes Grey, Lamp Black, Cool Grey 1,2&3 and Warm Grey 1,2&3. I’ll investigate the other Gouache ranges and add to this comment once I have found out for you. Thank you so much for this link! Lots of great info on there for Caran d’Ache users. free acrylic canvases too. Thanks. Thanks for your message – I’ll have a look into this and add what I can find to the blog post. It will be about the sizing/preparation of the canvas which would be the issue, whether it is primed with acrylic gesso or traditional rabbit skin glue sizing. vegan, vegetarian or not tested on animals. understand if a product is vegan or not. Many thanks! Thanks for your comment – I will contact the brands now and let you know as soon as I hear anything. From my own knowledge, M Graham uses natural blackberry honey and gum arabic in their paints but I don’t know whether ox-gall is also used. As soon as I hear back I will let you know!